Willow craned her head, trying to peer around a large branch that threatened to block her view of the events below. She and Notch had chosen a perch that kept them safe from view � at least they hoped � but also provided challenges in seeing things clearly. One of the human males stood in front of a ring of others, uttering phrases that neither elf could understand. His gestures seemed to indicate malicious mirth toward his tribesmen. However, his tribesmates� raucous laughter following each of the statements seemed to indicate that is was one big joke. A couple of times, members of the audience would launch equally humorous remarks back at the one who had given them initially. �I wish we could understand what they were saying,� Notch whispered. Willow could hardly hear him. **I�ve seen enough. We�d best get back with the others before we�re missed,** she sent. With a grunt, Notch agreed. They weren�t even supposed to be near the human camp, but how could they resist when the elves� hunting party had come close? 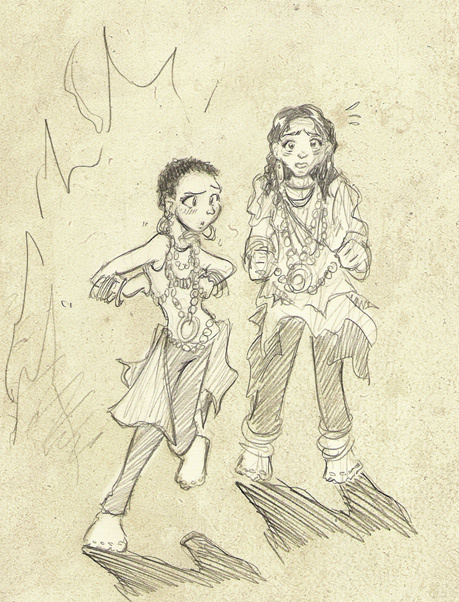 Well, not close in most of the party�s opinion, but close enough for two inquisitive elves to become too curious to resist a peek. The pair carefully climbed down the tree, and hesitated long enough to take one last peek at the strange man and those gathered around him who had not stopped laughing.